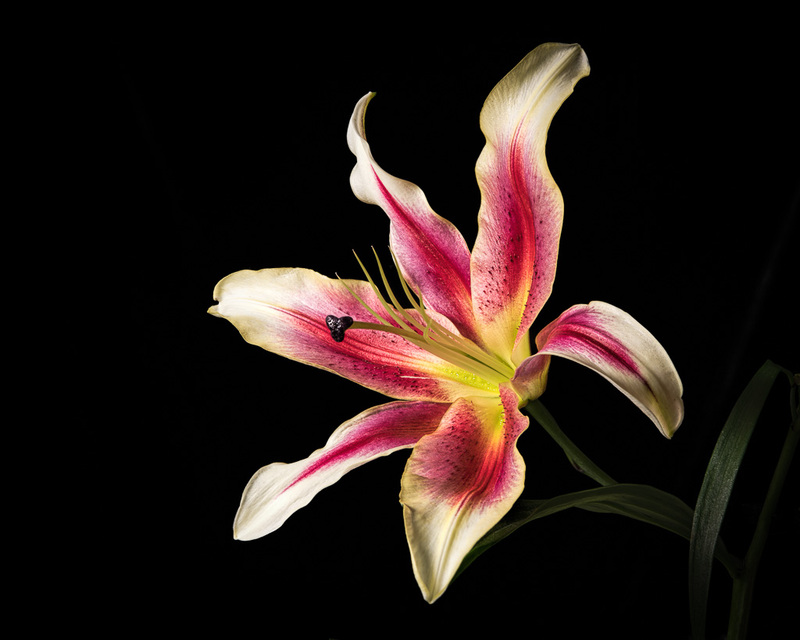 The Nikon D850 focus stacking facility is interesting and potentially very useful,but there is not much information on how to use it. What step size and how many images should be taken for a given magnification. I performed a simple experiment using the 105 f/2.8 AFS at f/8. The results are not well suited to post directly, but here is a link on the Adobe Cloud to a PDF describing the procedure and the results. 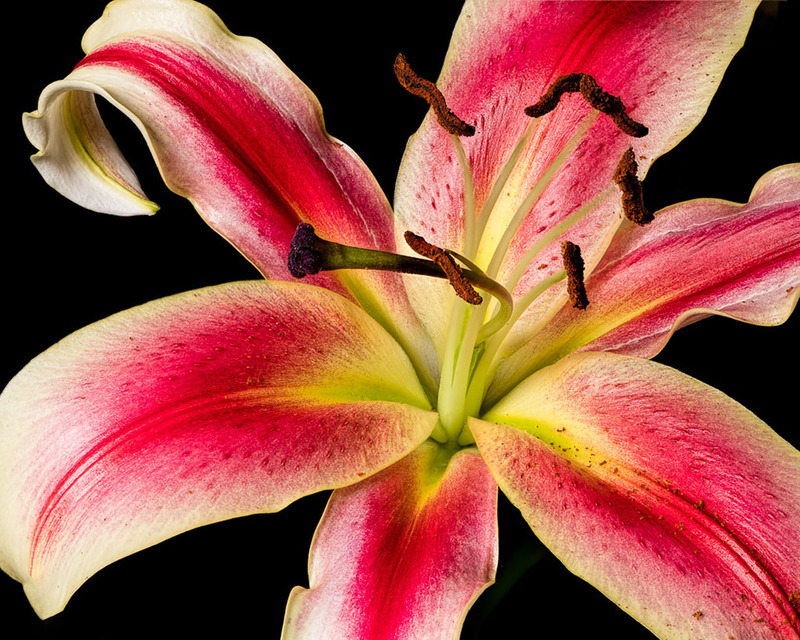 Comments are welcome, especially by Rik Littlefield since I used his DoF values. The DOF values at https://zerenesystems.com/cms/stacker/docs/tables/macromicrodof are computed "using a math formulation that is based on wave optics and guarantees no more than 1/4-lambda wavefront error for green light at the worst focus distances. Roughly speaking, this corresponds to no loss of fine detail and no more than 26% reduction of MTF at any spatial frequency." 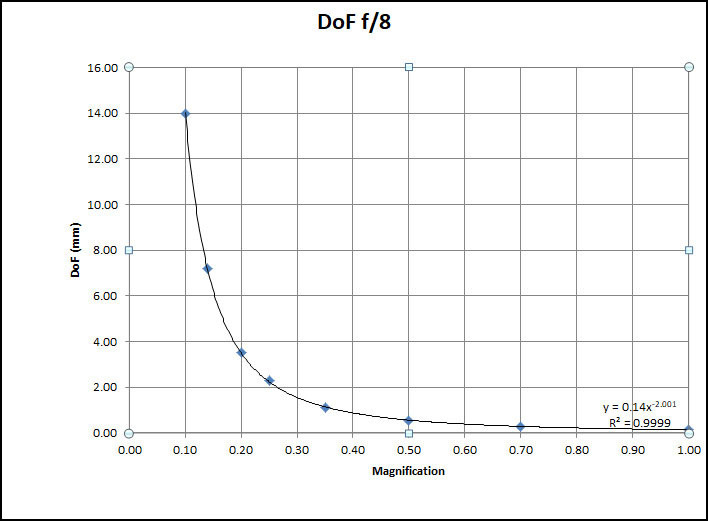 Those DOFs are proportional to (effectiveAperture/magnification)^2, so it's no surprise that your power fit with magnification^(-2.001) works really well. On the D850, I think it's still anybody's guess what the step size numbers really mean. We do know from John Sherman's review at https://photographylife.com/reviews/nikon-d850/4 that stopping down gives larger steps at the same setting. But we don't know whether those steps are larger in proportion to effective aperture to the first power, as implied by classic DOF formulas based on geometric optics, or larger in proportion to effective aperture to the second power as implied by the wave optics formulation. My guess would be that it's first power, mainly because the classic formulas are what everybody is used to. Sherman's result of ~0.9 mm at f/5.6 versus ~3 mm at f/16 is also consistent with first power but not second. We also know that the step sizes vary in proportion to magnification, and your results indicate that it's roughly a power function with exponent -2. That's not surprising. Not only is it the right thing to do, but it's also what happens if each step is just some fixed rotation of the focus ring. I have not noticed anything about whether step size varies linearly with setting number, versus any other relationship. That would be a very handy thing to know. It remains to be shown how the step size varies from one lens to another, particularly across brands. If Nikon did things right right, then their stepping will be tied into the same mechanisms that are used for predictive auto-focus, and the same setting will give the same step size with any lens at the same magnification and EA. It will be interesting to see what testing shows. As for recommendations, I think it's hard to beat the standard advice of using experiment to find some combination of settings that works well, then just keep using that: 105 mm MicroNikkor AFS at f/8, step size 5, done. I ran about 95 tests to see how this feature might work for macro/close up because Nikon provided no useful information. The variables are magnification, f-stop and step value. 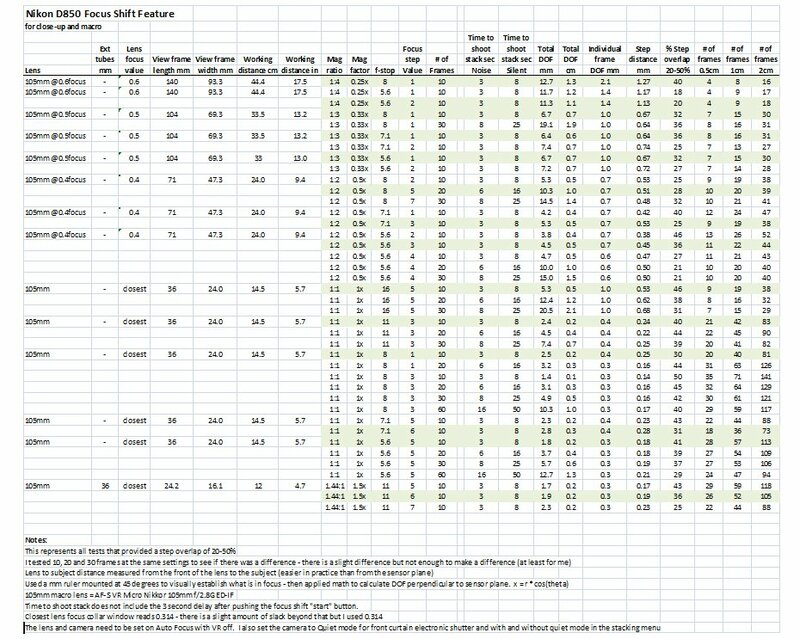 Here is my summary table for values that provided a 20-50% overlap in a focus stack series. I thought it would be linear and easy to understand. I got values to work but I don't understand the underlying principles behind the step values. Do you? using experiment to find some combination of settings that works well, then just keep using that: 105 mm MicroNikkor AFS at f/8, step size 5, done. seems to hold for f/5.6 when shooting between 2' to 3' from the sensor. I tried a few stacks with a step size of 7 and sometimes had some "soft bands" after processing with Zerene Stacker. With a step size of 5 there were none of these soft strips. Shooting 2-3' from the sensor using the 105 macro at f5.6. I didn't test anything at a magnification lower than 1:4 which put the subject 17.5" from the front of the lens. The values from my data table in an earlier post suggest the step values move from lower values to higher values as you increase magnification. I'm wondering if they move low to high going from 1:4 to even lower magnifications as you suggest working at 2-3'. It's a mystery until WE run the tests and do the math because I don't think Nikon tested this feature. As Rik pointed out earlier in this thread, DoF varies inversely with the square of the magnification. When one goes from m = 0.1 to 0.3, DoF decreases more dramatically than one might think. According to Rik's calculations DoF at m = 0.3 is 1.56 mm whereas at m = 0.1 DoF is 14 mm. I performed stacking of a flower using the Nikon D850 with "focus shift" with a step size of 5. A stack at m = 0.1 took 6 shots, and at m=0.3 20 images were required. Thank you, Bill. Very interesting.